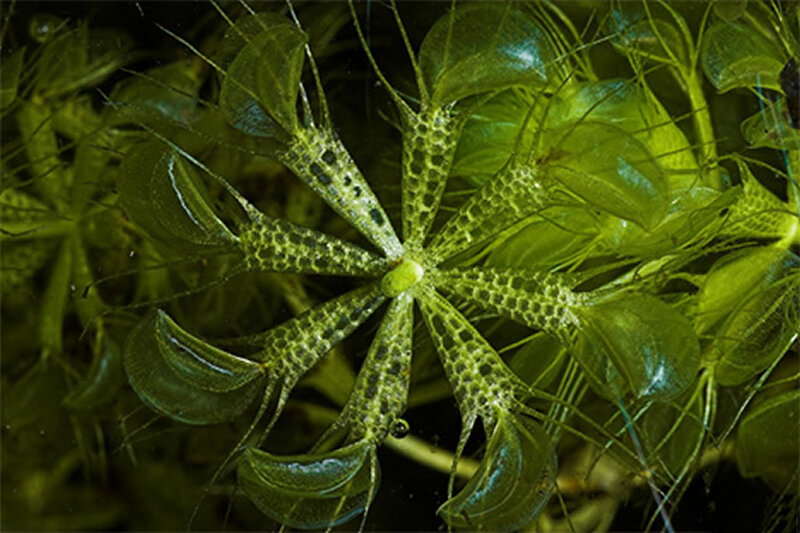 Distribution and habitat: Aldrovanda vesiculosa captures small aquatic invertebrates using traps similar to those of the Dionaea muscipula (Venus Flytrap). The traps are arranged in whorls around a central, free-floating stem, giving rise to the common name, the Waterwheel Plant. 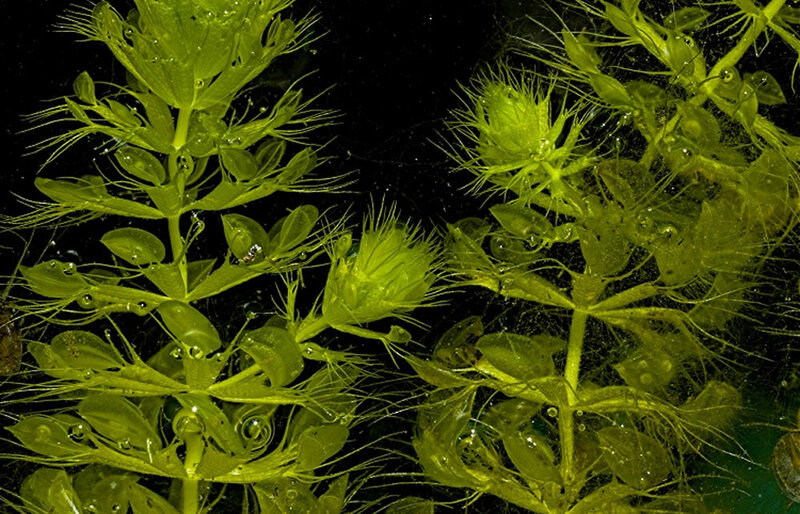 This is one of the few plant species capable of rapid movement. While the species displays a degree of morphological plasticity between populations, Aldrovanda vesiculosa possesses a very low genetic diversity across its entire range. Aldrovanda vesiculosa is the most widely distributed carnivorous plant species, native to Europe, Asia, Africa, and Australia. 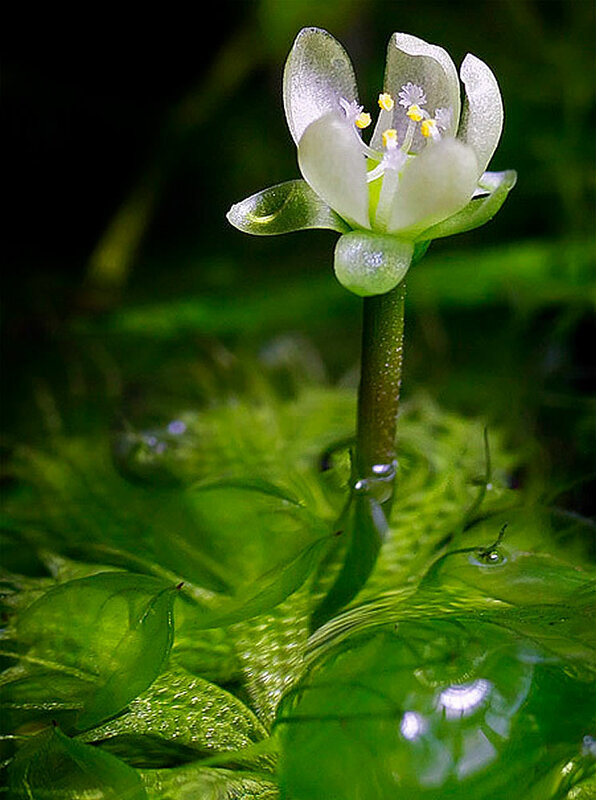 Aldrovanda vesiculosa is spread mainly through the movement of waterfowl – plants sticking to the feet of a bird are transported to the next aquatic destination on the bird’s route. As a result, most Aldrovanda vesiculosa populations are located along avian migratory routes. Throughout the last century the species has become increasingly rare, listed as extinct in an increasingly large number of countries. Aldrovanda vesiculosa prefers clean, shallow, warm standing water with bright light, low nutrient levels and a slightly acidic pH (around 6). It can be found floating amongst Juncus species, reeds and even rice. 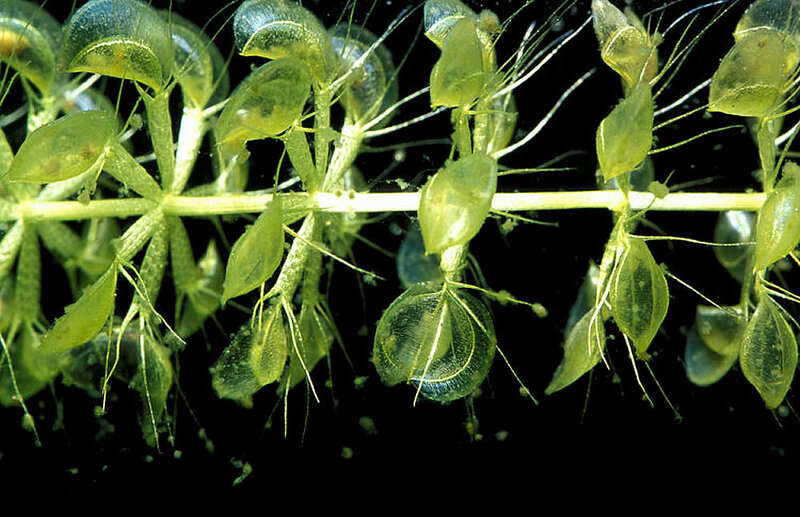 Decsription: Aldrovanda vesiculosa is a rootless aquatic plant; seedlings develop a short proto-root, however this fails to develop further and senescence. 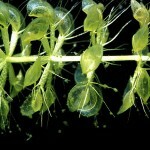 The plant consists of floating stems reaching a length of 6–40cm (2-16 inch). 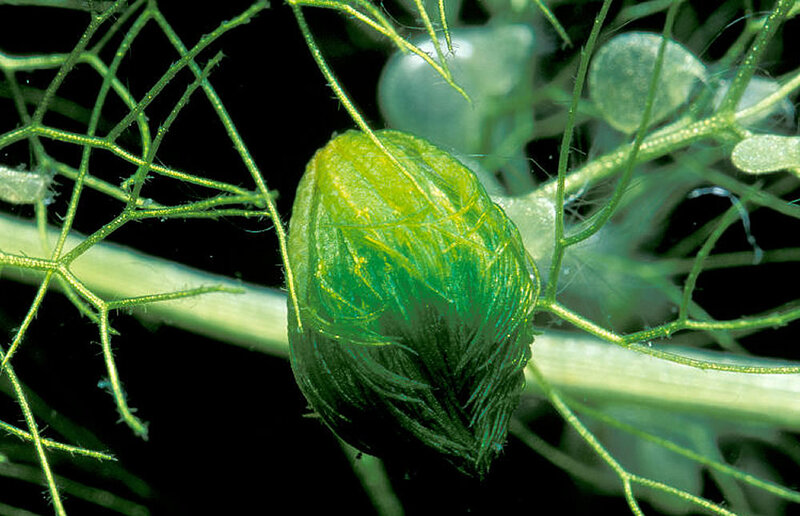 The 2–3mm (0.08-0.1 inch) trap leaves grow in whorls of 5-9 in close succession along the plant’s central stem. 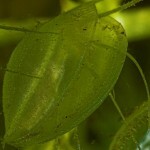 The actual traps are held by petioles which hold air sacks that aid in flotation. One end of the stem continually grows while the other end dies off. Growth is quite rapid (4–9mm (0.15-0.35 inch)/day in Japanese populations), so that in optimal conditions one or more new whorls are produced each day. 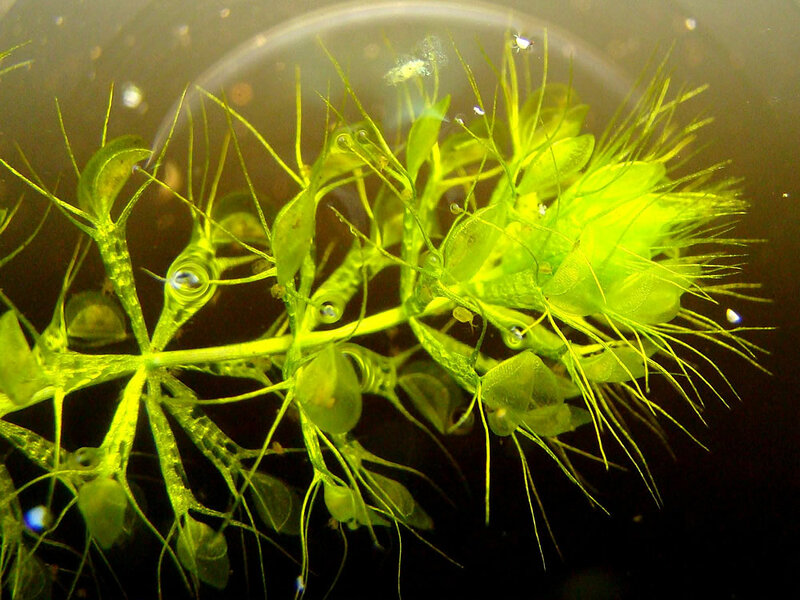 The actual traps consist of two lobes which fold together to form a snap-trap similar to that of the Dionaea muscipula (Venus fly trap), except that they are smaller and underwater. These traps, which are twisted so that the trap openings point outward, are lined on the inside by a fine coating of trigger hairs, snapping shut in response to contact with aquatic invertebrates and trapping them. The closing of this trap takes 10-20milliseconds, making it one of the fastest examples of plant movement in the kingdom. This trapping is only possible in warm conditions, when water temperature is about 20°C (68°F). Each trap is surrounded by between four and six 6–8mm (0.23-0.31 inch) long bristles which prevent triggering of traps by debris in the water. The small, solitary white flowers of Aldrovanda vesiculosa are supported above the water level by short peduncles which arise from whorl axes. 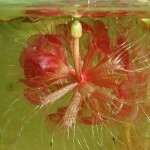 The flower only opens for a few hours, after which the structure is brought back beneath the water level for seed production. The seeds are cryptocotylar, meaning that the cotyledons remain hidden within the seed coat and serve as energy storage for the seedlings. 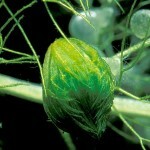 Flowering is however rare in temperate regions and poorly successful in terms of fruit and seed development. Care: To raise Aldrovanda vesiculosa it needs to set up a growing area for them. Outdoor growing generally works better than indoors growing, but they can be grown in a 38 litres (10 gallon) aquarium indoors successfully. Even smaller containers will work but at least 19litres (5 gallon) aquarium is needed and they perform better in bigger aquariums. The smaller the volume of the container, the more difficult it will be to create and maintain stable conditions. Periodic water changes and correct setting up of the container used to grow this aquatic carnivorous plant is essential. Is recommended to use a relatively shallow container with a large surface area. A water depth of 20-30cm (8-12 inch) is sufficient. Water: Most water is fine to use from moderately hard to softer water. When hard water is used, it is a must to grow companion plants with Aldrovanda vesiculosa to help take the excess nutrients out of the water. If CO2 is used, then something with a decent alkalinity (KH) is needed to keep the PH from going wild. When CO2 is added Aldrovanda vesiculosa will live happy in about anything as the CO2 is the key element for photosynthesis. Most carbon dioxide in water is produced by bacteria which are responsible for the decay of organic substances. Therefore, the more comfortable this bacterias are, the more valuable gas they will produce. PH of 4 – 7.8 is tolerated. 6.8 – 7.4 is ideal. Aldrovanda vesiculosa likes growing in ‘Brown Water’, named like this because the water is a brownish color from tannins released in water by the peat. 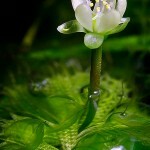 This carnivorous like growing in water that has decomposing plant mater in it, in other words, peat. Fresh plant parts dying and decomposing is bad as this encourages fungus. Old plant parts partially decomposed decomposing is good and that is exactly what peat is. Generally a 1/4 cup of peat per 4 litres (1 gallon) of water is good enough. Boil the peat and let cool, stirring occasionally as it cools to help release the air. Once the peat is cool it will sink well if keep covered in water after boiling. Also can be added some clay. Red, black or gray clay are all good. 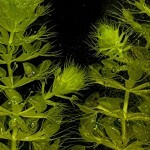 It gives the plants something to hang onto, it also helps the micro fauna and introduces some helpful bacteria. However, water conditions should become suitable and stable before introducing Aldrovanda vesiculosa safely. Healthy water should be clear, straw coloured, contain a variety of small living microorganisms and be as free from algae as possible. Light: If grown outside, place them in shaded ponds to keep water from over heating. When grown indoors, give them as much light possible. Temperature: In its natural environment, -15 to 30°C (5- 86°F) is tolerated. The water temperature during the growing season must be at least 16°C (61°F) with 32°C (90°F) as a maximum, but ideal temperatures are 23-30°C (73-86°F). 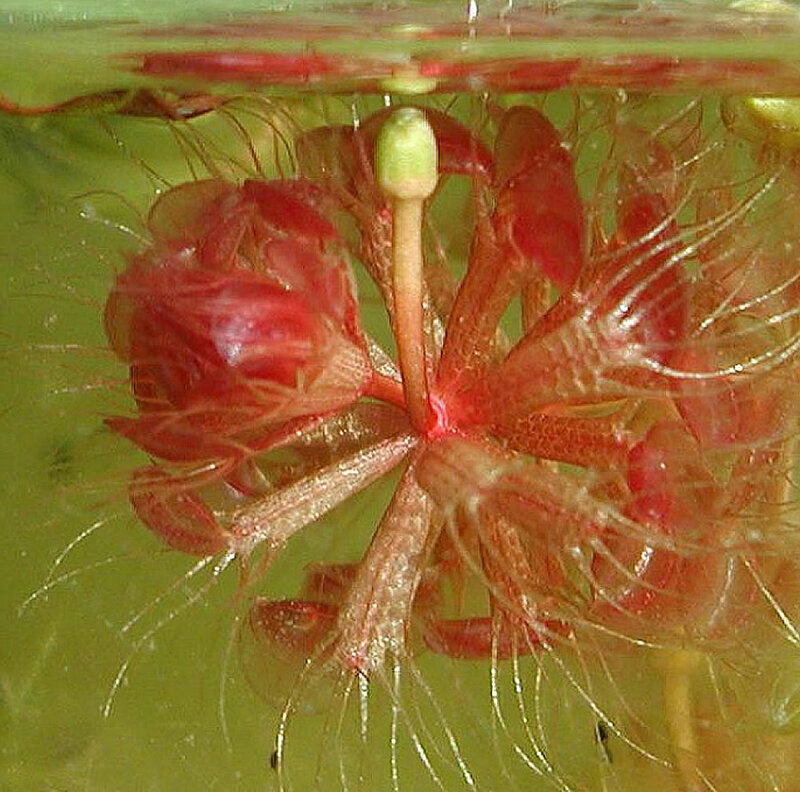 Prolonged water temperatures of 29-31°C (84-88°F) cause the Aldrovanda vesiculosa to flower. Prevent overheating by shading; in overheated water algae might become a serious problem. The water temperature should be cooler at night time then during the day, but this is naturally happening to some degree. Winter dormancy is occurring as day length and temperature drops, the plant will slow its growth and develop winter buds or turions at the plant tips. These will drop off, sink and over-winter in the bottom of the pool. The top of the pool may be ice covered, but the bottom should be deep enough so that the water does not freeze solid. The mature plants that are freezing will die, but in early spring as the water warms, the turions will begin growth and the new plants will float to the surface, often before other plants begin spring growth. For indoor culture, the turions may be kept in a peat slurry in the refrigerator at 3-5°C (37-41°F). Feeding: Aldrovanda vesiculosa is a carnivorous and like to eat! Make sure to supply them with a food source: Trumpet Snails are generally available at any pet shop that sells fish. They reproduce like mad and Aldrovanda can eat the young ones. These snails only eat dead plant parts, not live plant parts. Daphnia, copods, small fry, small tadpoles (tadpoles eat plants so do not add to many), mosquito larva and the like are all good. Be careful not to add something that will eat the Aldrovanda vesiculosa, as some snails that eat plants. Never add fertilisers (nitrogen/phosphorus/potassium) to the water. Propagation: Aldrovanda vesiculosa reproduces most often through vegetative reproduction. In favourable conditions, adult plants will produce an offshoot every 3–4cm (1-1.5 inch), resulting in new plants as the tips continue to grow and the old ends die off and separate. Due to the rapid growth rate of this species, countless new plants can be produced in a short period of time in this fashion. In winter hardy Aldrovanda vesiculosa form so-called ‘turions’ as a frost survival strategy. At the onset of winter, the growth tip starts producing highly reduced non-carnivorous leaves on a severely shortened stem. This results in a tight bud of protective leaves which, being heavier and having released flotational gases, breaks off of the mother plant and sinks to the water bottom, where temperatures are stable and warmer. Here it can withstand temperatures as low as −15°C (5°F). In the wild, Aldrovanda turions have been observed to have a relatively low rate of successful sinking. Those nutritious turions that fail to sink are then grazed by waterfowl or are killed by the onset of frost. In spring when water temperatures rise above 12-15°C (54-59°F), turions reduce their density and float to the top of the water, where they germinate and resume growth. Non-dormant turion-like organs can also form in response to summer drought. Problems: Good indicators of the plant’s health are the thickness of its apex (thick, onion-shaped-good; thin-bad), the length of the adult plant (more than lcm (0.4 inch)-good) and the number of branches (few-good; none-bad). 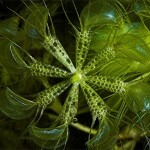 The big killer of Aldrovanda vesiculosa are Algae growth. 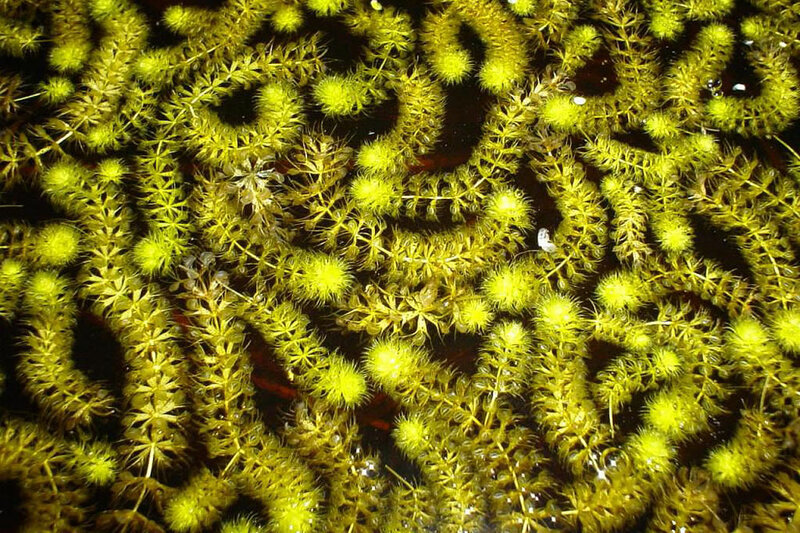 Treatment: Addition of chemicals (alum, copper sulphate) only solve the algae problem temporarily and are not appreciated by Aldrovanda vesiculosa. If CO2 is used it will help prevent algae growth. It should not be much of a problem for indoor tanks once the tank has aged. 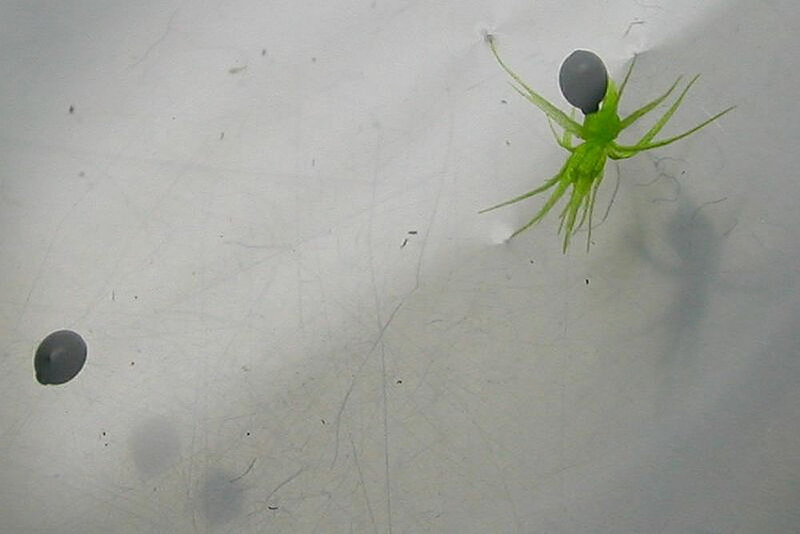 Add daphnia or snails to help keep it cleaned up as these are in the same time food for Aldrovanda vesiculosa. Change every other week 10% of water or as needed on indoor setups. Outside setups can be a little harder to keep under control. Change the water as needed and keep the CO2 levels up if applicable. Boron Deficiency will cause a steady decline in the plants until they die. Treatment: Most plant stores sell a product to treat it with. This is a rare disease or macro vitamin deficiency. Companion plants: Aldrovanda vesiculosa should be grown with other water and/or marsh plants as they helps to lower the nutrient levels in the water by direct uptake and by stimulation of the decomposition process. Companion include Utricularia inflata and other Utricularia species will consume extra nutrients from the water. It is important to include other submergent plants in pots such as Typha species (Cattail), Pontederia species (Pickerel Weed), Nymphaea species (Water Lilies) or Sagittaria species Arrowhead Plant. 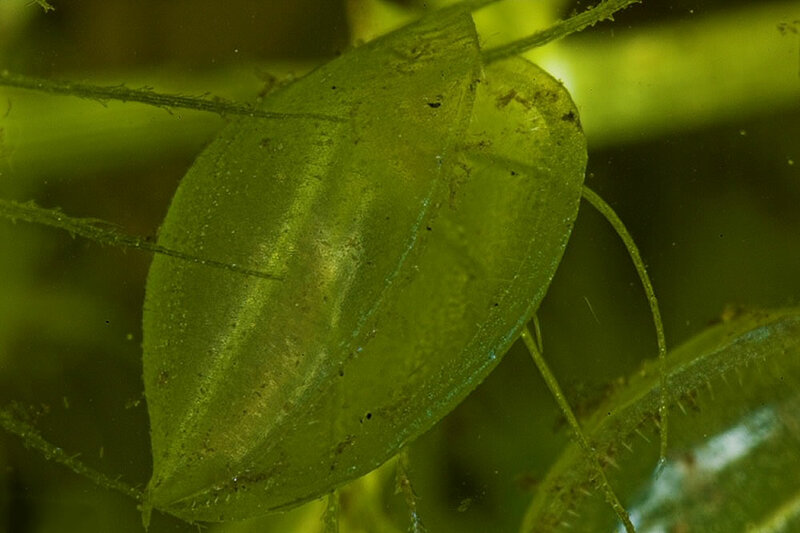 The leaf litter generated by these companion plants is essential to promote the growth of daphnia, protozoa and other aquatic “food.” In addition these companion plants keep algae growth to a minimum during the warm growing summer months. Notes: Aldrovanda vesiculosa is one of the strangest plants around. 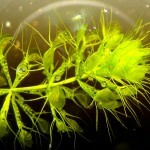 It is more widespread than any other carnivorous plant, being also a rare and endangered species. Do not introduce these plants in bodies of water they do not already inhabit. Use: Consider growing Aldrovanda vesiculosa outdoors. They can tolerate frost or a light freeze. They grow exceeding well in a bog pools in the yard. 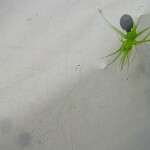 Also they can be grown in an aquarium indoors successfully.